OLYMPUS says its new VS120 virtual slide microscope system is the only microscope-based virtual slide system to offer darkfield illumination. 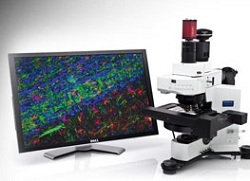 This novel whole slide imaging system also offers brightfield and fluorescence illumination. Darkfield imaging is favoured in situations where the resolution of structural detail is desired in microscopic observations, especially on non-stained specimens. It can be combined with brightfield or fluorescence imaging in order to gain insights into both structure and function. Darkfield illumination is popular in neuroscience, such as brain imaging and connectome mapping, where many researchers prefer to use unstained samples. Olympus says it also proves useful for researchers using silver staining. The darkfield illuminator attaches to any Olympus VS120 or VS110 microscope using a simple stage insert. The microscopy system scans up to 100 slides at a time at very high fidelity, so that users anywhere in the world can view and fully navigate high-resolution images of entire microscope slides or slide areas using a computer. It is designed for wide variety of research applications, and also has uses in training, education and archiving.